On July 3rd, 2016, my life changed forever. It was on this day that I ate one of the best meals of my life: gnocchi and pesto cream sauce. I was visiting one of my dear friends from college, who happens to live in our college town of Gainesville, Florida (Go Gators!). We all went to one of the best restaurants in town, called, fittingly enough, The Top. I had been there many times before but wanted to try something different so I ordered a popular dish in their Yelp reviews, which was their gnocchi with pesto cream sauce. Wait – before I continue, let me explain what gnocchi are, for those of you who don’t know. Gnocchi are small little potato dumplings that are native to Italy and typically served with sauce. It’s made similarly to pasta, except with potato added to the dough. I was a little hesitant at first because I wasn’t the biggest fan of gnocchi – the previous times I had it, it was too dense and bland. But I love pesto so I gave it a shot. And thank goodness I did! The gnocchi were the lightest little clouds from heaven that melted in my mouth and the sauce was so rich and creamy and full of so much flavor. Every single bite made me moan in happiness. How did I not discover this sooner?! It’s been more than two months since I discovered this meal but I haven’t forgotten it. I’d been planning to recreate it and finally I did it! 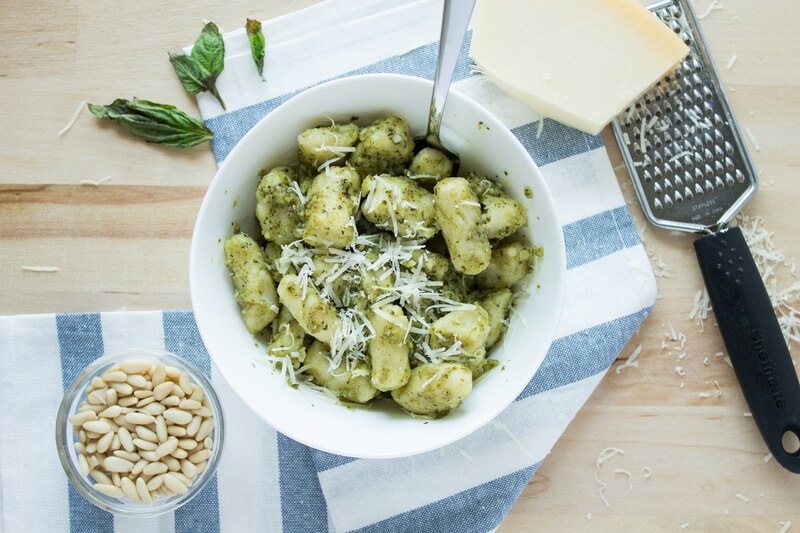 Today’s post has two separate recipes: one for the gnocchi and one for the pesto cream sauce. You can obviously use a different pasta or a difference sauce if you don’t want both elements, but I am telling you: the combination of these two will change your life just like it did mine. First let’s talk about the pesto cream sauce. It’s super simple. Just pesto and cream. But here’s the thing: I’ve never made pesto before. I hate taking out my food processor so I avoid it as much as I can. But now I had a reason to make it. It took all of 5 mins to process the ingredients together. That’s it! 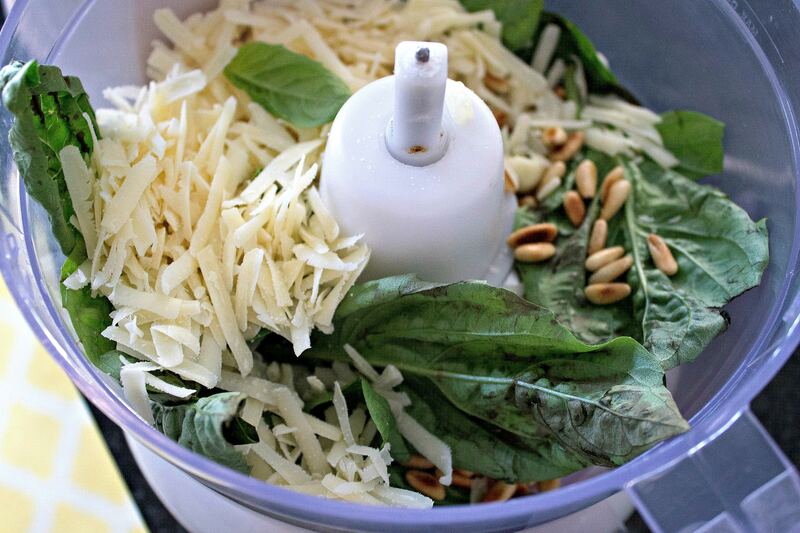 Parmesan, basil, garlic, toasted pine nuts, and olive oil. Simple as that. To complete the sauce, add butter and cream to a saute pan to warm it up a little. Then, add the pesto and combine together. Let the sauce bubble a little and then reduce to a simmer. Then add the cooked gnocchi straight to the sauce. If the gnocchi isn’t formed yet and ready for boiling, don’t start the sauce. It doesn’t taste as creamy when you heat it up again so it’s best to wait until you’re about to serve the gnocchi to make it. Speaking of gnocchi, let’s talk about making it from scratch. It’s even fewer ingredients than the pesto: potatoes, flour, and egg. Boom. That’s it. Maybe a few more steps but I’ll walk you through everything. You got this! You must use a potato that is starchy and has thick skin, like a Russet potato. If you use a red potato or Yukon gold, it will have too much water (and absorb even more water when you boil them) that it will make your gnocchi gummy and dense. Yuck. And on that note: make sure you don’t peel them or cut them into pieces when you boil them (i.e. you must boil them whole), or they will be exposed to too much water and absorb it while they boil. Use a potato ricer to break up the potato. Do not use a food processor or it will make the gnocchi gummy and pasty. It will be impossible to work with. The ricer makes the potato super fluffy so it will mix easily with the flour and egg. I didn’t have a ricer so I had to buy one. This is the one I got and it worked perfectly. Do not over-work the dough. You just need to combine it enough to bring it all together. Otherwise, your gnocchi will be dense and tough. If you want to save some time, you can make them ahead of time and and place in the fridge in a storage container after boiling. Make sure to toss in oil so they don’t stick together. When you’re about to serve, heat sauce in a saute pan, add gnocchi and heat them up together so the gnocchi absorbs the flavors of the sauce. This recipe makes enough for 12 people. If you don’t need that much, you can freeze the unboiled gnocchi and save for later. To freeze: toss unboiled gnocchi in a little flour. Place on a baking sheet and make sure none of the gnocchi are touching. Freeze until solid. Once they are solid, you can place the frozen gnocchi in a storage bag or container and keep for later. Just toss them into a pot of boiling water when ready to make. Okay guys. Now you know how to make this amazing dish. You gotta make this for your next dinner party or romantic evening or any other time you want to impress someone with an incredible meal. It’s a showstopper, trust me. There is nothing like homemade pasta. And this gnocchi recipe is no exception! 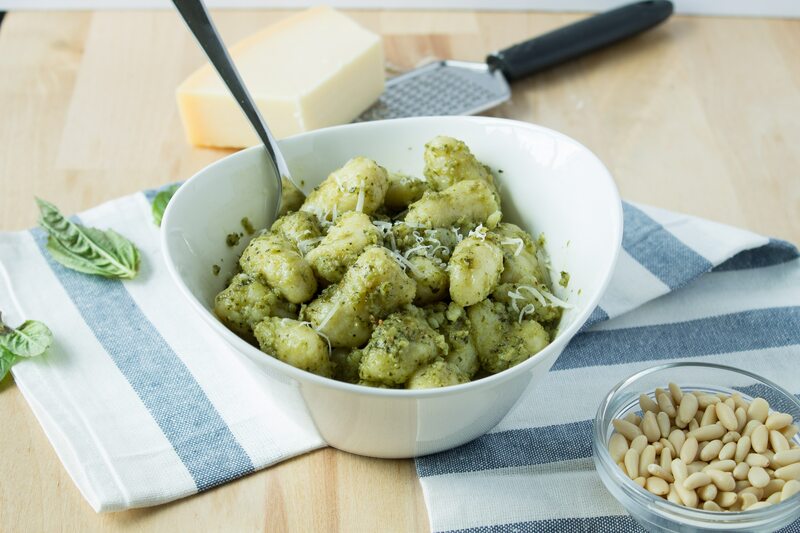 The gnocchi (or potato dumplings) are so light and airy that they melt in your mouth and the rich and nutty pesto cream sauce is the perfect compliment for this impressive dish. Add unpeeled, whole potatoes to a large pot. Add cold water and fill pot so that water fills about 1 inch above potatoes. Place on stove and set to medium-high so that water begins to boil. Boil until potatoes are completely cooked, about 45 minutes. While potatoes boil, you can work on making the pesto (see instructions below). Once cooked, remove potatoes from water (but do not toss water; you will use it to boil gnocchi) and immediately peel and pass through a potato ricer. Place riced potato on a clean counter surface. Sprinkle flour all over potato. Make a well in the center of the potato and flour mixture. Place egg in center of well. Using a fork, scramble egg and incorporate into potato and flour mixture. 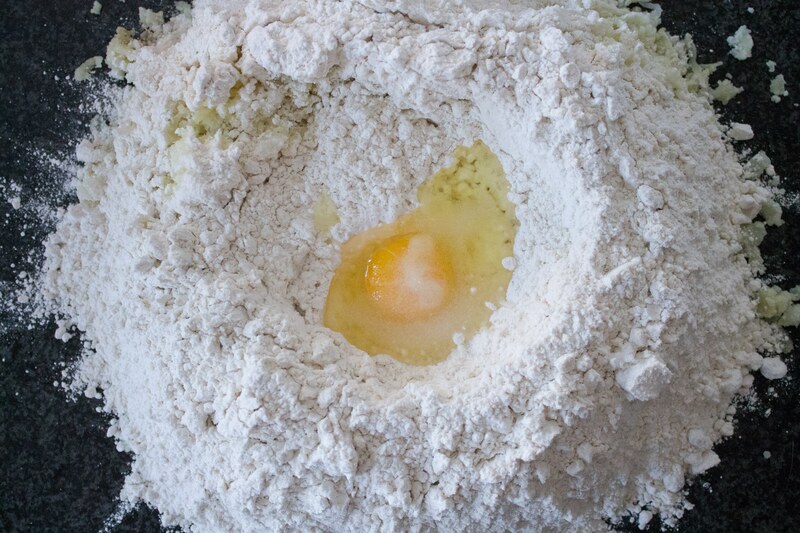 Once egg is mixed it, use your hands to incorporate the rest of the potato and flour mixture until a smooth ball forms. Cut dough in 8 sections. Grabbing one section at a time, roll into a long log, about 2 feet long. Cut log into 1 inch pieces. Roll each piece into an oval to form the dumpling. Repeat with 7 other sections. Add a little flour to surface if the dough gets too sticky. Boil gnocchi until it floats to the top (about 1 minute). Do not over-crowd the pot with gnocchi. Only place enough dumplings to make one layer of gnocchi. See below on steps on how to serve the gnocchi. Toast pine nuts and garlic (still in peel) in a small saute pan over medium heat for 1 minute. Remove garlic. Continue toasting pine nuts until they get dark golden brown, about 2 more minutes. Be careful! Pine nuts toast quickly so you must watch them closely. Remove garlic from peel and place into food processor with basil leaves, Parmesan cheese, pine nuts, and salt and pepper to taste. Begin processing, drizzling in olive oil while it mixes. Set aside. 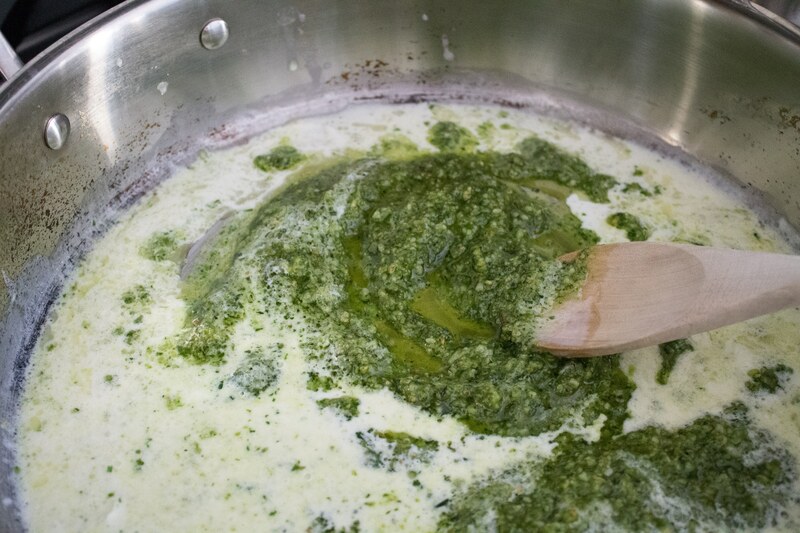 Add cream and salted butter to saute pan over medium-low heat and bring to a simmer, Add pesto and combine. Heat through for a minute or so until hot. Add gnocchi to pan based on directions below. 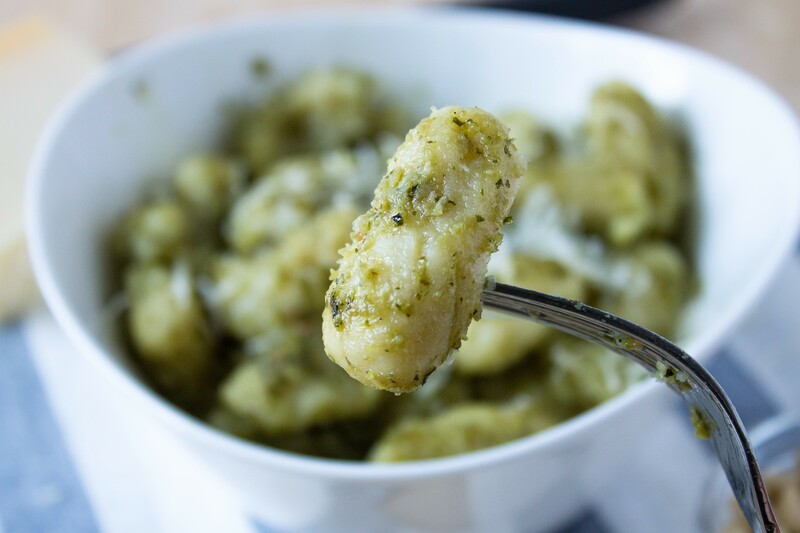 Place 1/2 of cooked gnocchi in saute pan with prepared pesto cream sauce. Stir together and cook until warm, about 2 minutes. Serve. Place remaining gnocchi in a storage container and mix with 2 tablespoons of olive oil to store for future use. Note: if you want to serve all the gnocchi, make double the amount of pesto cream sauce. If I don’t make the gnocchi by hand, how much would the recipe call for in a package?? This makes about 6 servings. So the amount of premade gnocchi you need depends on how much is in a package. Hope that helps! I’ve never made gnocchi before but I’lll have to try this. It looks great! Thanks to much! It’s a lot simpler than it seems. Also, fun to do with a friend or spouse or even kids! The title snagged me but the pictures are even more beautiful than I expected. Great job! Wow what a great compliment! Thanks so much! This looks so yummy! I love anything with pesto, it makes everything taste so fresh! I know, right?! It’s the one sauce my husband and I love equally. And it’s so easy to make. Can’t beat that! Drooling over here! I am going to have to try this soon – love a good pesto. And the cream too?? YUM. Pinned to make this week! Yay! I hope you have so much fun making it. Let me know how it turns out! Thank you so much Sharon for sharing this! 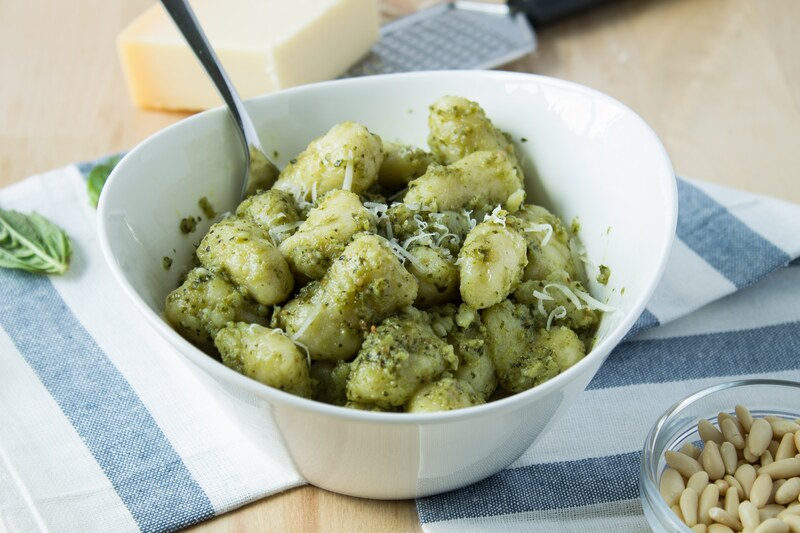 I love gnocchi and I love pesto sauce but I never tried it together. I am a terrible cook so I might not make the gnocchi myself but I will give the pesto a try! P.S. : My very first American Football game was a gators game! Yum, this looks absolutely delicious! I bet it would be great with a kale pesto sauce too! I love gnocchi! And the perfect partner to basil pesto – so yummy!